Issue no. 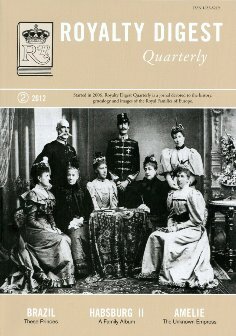 2, 2012 of Royalty Digest Quarterly, "a jo[u]rnal devoted to the history, genealogy and images of the Royal Families of Europe", arrived in my mailbox on 29 June, but I haven't had much time to have a look at it before now. As usual there is plenty of reading material, and I plan to bring it with me to read during my vacation. The photo at the front cover shows a few Habsburg cousins in the 1890s. From the left Archduchess Maria Theresia, wife of Archduke Karl Stefan; Archduke Rainier and his wife Archduchess Maria Caroline; Archduchess Karoline (sister of Archduchess Maria Theresia and wife of Prince August of Saxe-Coburg and Gotha); Archduke Eugen; his mother, Archduchess Elisabeth; her nieces, the Belgium-born Princess Louise of Saxe-Coburg and Gotha (standing) and Crown Princess Stéphanie, the latter was married to Crown Prince Rudolf of Austria in 1881; he committed suicide 8 years later). Prince August (1867-1922), or Prince Augusto as he is also known as, reappears in the opening article, These Princes who came from Brazil, which deals with his father, Prince August of Saxe-Coburg and Gotha (1845-1907) and the latter's cousin Prince Gaston d'Orleans, Count d'Eu (1842-1922), who married the Brazilian princesses Leopoldina and Isabel respectively in 1864. Their descendants are also well covered. Next one out is the traditional family album by Charlotte Zeepvat, titled Habsburg - A Family Album: Part II. Dukes of Teschen and Palatines of Hungary. Following a short introduction, the readers can enjoy 94 images of royals and palaces, as well as the customary 3 pages with genealogical charts. The former Imperial throne of Brazil gets lots of attention in this issue. Claudia Thome Witte has contributed with the article Amelie - an unknown Empress, which of course deals with Empress Amelie (1812-1873), née Princess of Leuchtenberg, wife of Emperor Pedro I and sister of Josephine, who became Queen of Sweden. Marion Wynn then follows up with an article about the marriage of Princess Marina of Greece (1906-1968), main-titled A Royal Romance. She married Prince George, Duke of Kent, in 1934. There are also several book reviews and one book presentation to read. Diana Mandache has been allowed to present her book Patrie şi Destin. Principesa Moştenitoare a României ("Fatherland and Destiny. The Crown Princess of Romania"), published by Litera, Bucharest. The book covers the life so far of King Mihai of Romania's eldest daughter Margarita. The books reviewed are Dear Ellen. Royal Europe Through The Photo Albums of H.I.H. Grand Duchess Helen Vladimirovna of Russia by Arturo E. Beéche (Eurohistory & Kensington House Books, CA, USA, 2011); Maria Pia de Sabóia - Fotobiografica by Maria do Carmo Rebello de Andrade (Palácio Nacional da Ajuda, 2011); "Reis no Exílio, Portugal refúgo real" by Charles-Philippe d'Orléans (Esfera de los Livros, 2011) and "Estoril los Años Dorados" by Ricardo Mateos Sáinz de Medrano (Esfera de los Livros, 2012). Beéche's book is reviewed by Charlotte Zeepvat, while Alberto Penna Rodrigues is responsible for the others. The column The World Wide Web of Royalty this time covers genealogical news from Bavaria, Bourbon-Parme, Denmark, United Kingdom, Liechtenstein, Oettingen-Wallerstein, Sayn-Wittgenstein-Berleburg, Spain, Stolberg-Stolberg and Sweden. 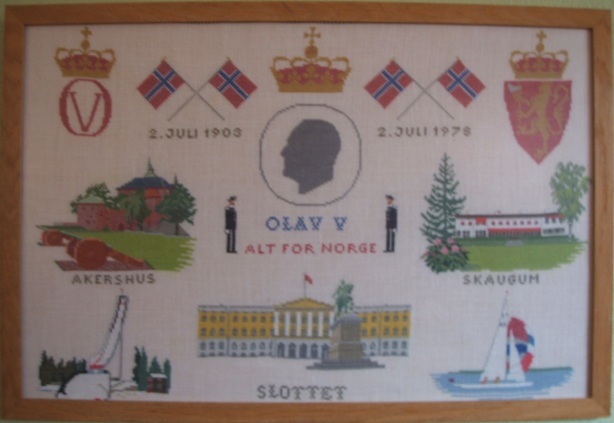 Embroideries with royal subjects are not an unusual sight, but still nice to see! The embroideries pictured above were made in connection with King Olav V of Norway's 75th birthday in 1978 (photo 1) and his 80th birthday in 1983 (photo 2 - a pity the photo quality was not better) and are displayed at Glomstad Guesthouse in Øyer municipality not far from the Olympic City of Lillehammer. I don't think this King Harald V purse is for sale, but have to say that at least the embroidery is nicely done! 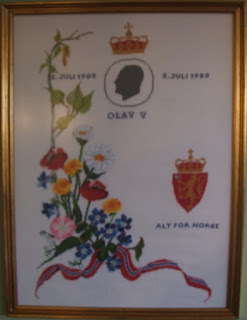 The blog Linens and Royals shows photos of King George VI coronation samplers and has links to other embroidery-themed articles.